Petitions abound calling for the resignations of David Emerson, late of the Liberal Party, and Michael Fortier, late of the "unite the right" Forward-Thinking Group and rewarded, it appears, for having sold out his party, the Progressive Conservative Party of Canada. 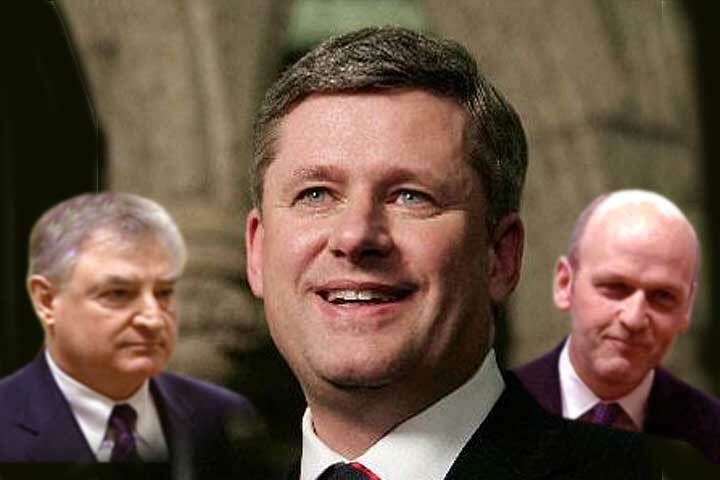 Where is the petition calling for the resignation of Stephen Harper, the unprincipled Machiavel behind it all? Party leaders come and go, while prime ministers rightly serve only at the pleasure of the Monarch, for the head of state and temporary head of government must never be confused. Mr. Harper's ruthless pursuit of power is a matter of record, invariably framed as the ends justifies the means and most recently dismissing criticism as mere superficiality. Surely, if it is time for anyone to go, it is Stephen Harper. His going will serve Canada well, and it will please those within his party who both hoped for and expected a defeat for their party which would allow a cleansing of the taint of Reform. That they were too clever by half, allowing an illusory "uniting the right" to deceive Canadians less focussed daily on political affairs into thinking that what was being created was to be Conservative. These first great scandals of the Harper Alliance Conservatives cry out for the Heave for Stephen Harper in full parliamentary tradition, while the deceiving of Canadians as to the nature of the party itself calls out not for a by-election but a general election sooner rather than later. Unlike the election just passed it will be neither unwanted or unnecessary.